Here’s my last column for the print version of The East Valley Tribune. On Jan. 1, the paper ceases distribution in Phoenix, Scottsdale, and Tempe. Home delivery will be restricted to four days a week and only in certain neighborhoods (upscale ones, natch!) in Mesa, Chandler, Gilbert, Queen Creek, and Apache Junction. You’ll be able to pick up paper copies at Circle Ks and convenience stores. Sic transit gloria mundi, and it’s actually a blessing that Jonathan Marshall isn’t around to see the final demise of the Scottsdale Progress. Lots of local ‘wingers complain that the major daily is “too liberal” and thus losing readers. But the paper closer to their editorial viewpoint folded first. Apparently there are enough ‘wingers to support talk radio or a newspaper, but not both, and reading is lots harder than listening. Ditto that! I did get one fun email from a friend who grew up in Mesa, who used to be a delivery boy for the old locally-owned Tribune, and who in high school became a stringer reporting on high school sports. He got paid $2 per column inch, which 50 years later was still the going rate. I like to steal Calvin Trillin’s line and say I got paid in the low two figures. Newspaper version of the column are available here (basic version) or here (how it looked on paper, for the last time). The editor took out some parentheticals and throw-away lines, and this time I’ve left them out except the Arpaio one in the third paragraph, that one stays. Maricopa County Attorney Andy Thomas must love “Monopoly” because he just invented the real-life “Get Out of Jail Free” card. In intra-party squabbling that would be deemed too absurd for a soap opera, Thomas charged county Supervisor Don Stapley with dozens of felonies for filing incorrect financial disclosure forms. Thomas did wait until after the election, but Stapley didn’t seem appreciative. The county attorney is legal advisor to the county and its elected officials, but Stapley seemed dubious about getting legal advice from somebody seeking to convict him. The other supervisors agreed to hire outside counsel for so long as Thomas is prosecuting his ostensible client. And whom did the supervisors select as their “outside legal consultant” (not lawyer)? Thomas’s predecessor, Rick Romley, who before he left office, was engaged in a long-running battle with Sheriff Joe Arpaio that could only be described as nasty, for there are no other types of battles possible with Arpaio, for whom all things are either personal or irrelevant. Who needs Democrats (not that we have any in Maricopa County elected office, save for Supervisor Mary Rose Wilcox) to cause trouble when Republicans are so good at fighting among themselves? The infighting provides a welcome distraction from the fiscal difficulties that the county, with tax revenues dependent on development and retail sales, finds itself in. Like the ancient Romans, with less bread, we need more entertaining circuses. For people who found the Romley-Arpaio feud beneath the dignity of both men and the exalted standards of public service in county government, who saw Thomas’s election in 2004 as a chance to resolve the friction between the two leaders of county law enforcement, well, you got your wish. The county attorney and sheriff now get along just fine. They just can’t get along with anybody else. But the most interesting innovation developed by County Attorney Thomas is his expansion of the law of conflict of interest, which you (and criminal lawyers) could use to advantage. Remember that Maricopa County paid all that money to Thomas’s former employer, Dennis Wilenchik, to arrest the publishers of the Phoenix New Times newspaper because Thomas declared a conflict because of the paper’s strong, even pungent, editorial stands against him. Then when arresting newspaper publishers turned politically dicey, Thomas rose above supposed principle requiring his recusal and personally called off the investigation. Thus, according to Andy Thomas, for a mere $390, you’re irrevocably prejudiced against him. So wouldn’t that mean that a $390 contribution makes Andy Thomas irrevocably prejudiced against you? If I were a criminal defendant like, say, Don Stapley, I’d start writing angry newspaper columns against Thomas and send a $390 check to Tim Nelson to retire any remaining campaign debt immediately. Then you could demand (using Thomas’s own arguments) that Thomas recuse himself and send the case to a more rational, less grandstanding, prosecutor. Finally, please excuse a personal note. Along with the other changes at The Tribune, our Freedom Communications overlords eliminated the budget for outside writers, including their “house liberal.” So this column is my last, as it’s a bad idea to work for libertarians for free, it gives them the wrong idea. I greatly enjoyed, and appreciated, jousting with the editors, and with you readers, too, these past nine years. For future installments, however, visit my blog, www.samcoppersmith.com. Plus At No Extra Charge, We've Thrown In "The Star Spanglish Banner" Song, Too! It's uncanny how the same people who a few weeks ago got their knickers totally twisted over Pres.-elect Obama using the phrase "lipstick on a pig" are suddenly in the "light-hearted political parodies" business. Our favorite Phoenix-area dim sum restaurant won't open for a couple of hours, but one of my favorite artists (especially this song) is part of an urban hipster Jewish Christmas Eve tradition. (And it's not the War on Christmas.) So from our house to yours. Lyrics (and tragic backstory) here. Here’s the next-to-last Tribune column. My suggested headline was above, but even I thought that wasn’t suitable. However, my original lede was “This week, several disconnected thoughts (usually called the “Political Notebook” or “Quick Hits” style of column)” but the parenthetical got edited out. Too close to home, apparently. So, do you think that those Republicans, outraged that Gov. Napolitano is still governor until her confirmation as Secretary of the Department of Homeland Security, who are demanding that she stop issuing executive orders, will contact “still President” G. W. Bush and demand the same from him? Arizona Tax Credits -- Act Now! Dec. 31 looms, so make your contributions to qualify for Arizona’s dollar-for-dollar tax credits for donations to private school tuition organizations (up to $500 individuals, $1,000 jointly), public schools ($200/$400), working poor charities ($200/$400), and Clean Elections ($610/$1,220). But -- as I discovered only after filing my Nov. 30 column -- this year through 2012, there’s one more state tax credit, for the Military Family Relief Fund operated by the Arizona Department of Veterans’ Services. You donate to the MFRF, up to $200 for single taxpayers and $400 for joint returns, and get a federal deduction and a state dollar-for-dollar tax credit. You’ll need a receipt from ADVS, and to give you a receipt, ADVS needs your full name, address, and last four digits of your Social Security number, all of which is required by law. Send your contribution to MFRF, c/o Arizona Department of Veterans’ Services, 3839 N. 3rd Street, Suite 200, Phoenix, AZ 85012. A form for the contribution is available at the ADVS website, www.azdvs.gov, scroll down to the MFRF link, or contact Diane D’Angelo, MFRF Outreach Coordinator, by email at ddangelo@azdvs.gov or by phone at (602) 263-1837. Give Blood -- But Call First. In the tax credit column, I always urge you to donate blood by contacting United Blood Services at (602) 431-9500 or at www.bloodhero.com. But the last two times I’ve contacted UBS, they haven’t needed my blood as much as in the past. My next donation instead will be white blood cells, not red. My blood type is pretty common, so with many donors like me, blood banks now can search for more specialized and rarer blood. That’s not because suddenly Americans became unafraid of needles, but rather the recession is reducing elective surgeries and the need for blood. So still consider becoming a donor, but call first to make sure your blood will be needed. The usual wisdom has been that health care is, if not recession-proof, then at least not affected as much by a bad economy. Instead, physicians and hospitals often see increases in elective surgeries -- knee replacements, dental work -- as people expecting to lose their jobs want work done before their insurance, or their post-employment COBRA benefits, run out. That’s not true for all facing economic uncertainty; some of the “pre-uninsured” decline treatments, because they don’t want any pre-existing conditions in their records when searching for new jobs and insurance. But recessions do reduce demand for health care; according to a stock analyst quoted in Business Week, demand for hospital services during the 2001-02 recession was the lowest on record. And this recession will be far more severe. My prediction for the biggest health care losers this recession are the specialty hospitals and surgery centers which depend on higher-margin elective procedures. People cutting back on their spending won’t just keep their current car a year or two longer; they’ll keep their existing body parts, too, until the economy turns around. Teaching By Example. State legislators are already announcing that the state’s budget situation will mean cuts to education funding. Fairness requires that legislators match funding cuts with similar percentage reductions to required scores on the AIMS test, doesn’t it? I await these legislators reminding parents that it’s all about individual responsibility, that they shouldn’t have had children who would wind up needing to be educated during a recession. You simply can’t expect government to bail you out of those kind of mistakes. But if schools have to do more with less, the legislators should show them how. Rather than increasing the political contribution limits by inflation as the state does every cycle, instead legislators should reduce the contribution limit by the same percentage as the per-pupil cut to education funding. Show the schools how to do more with less by doing it in your own political fundraising, legislators. It’s the least that leadership requires. If You Drive In Phoenix and Know about the Middle-of-the-Road Turning Lane, Why Would You Want to "Govern From The Center?" Before we get to this week’s column, Arizona taxpayers need to know that there is one more state tax credit that allows a dollar-for-dollar credit against your Arizona personal income tax liability for a charitable contribution. It’s the Military Family Relief Fund credit, which is available only for tax years 2008 through 2012, so it’s both new and time-limited – and, of course, news accounts of this new credit all appeared after my annual tax credit column. But, via the miracle of the Internet, I get to revise and extend my remarks. The MFRF credit is available only to individuals; corporations can’t claim the credit, nor may partnerships, LLCs, or S corporations pass the credit through to partners, members, or shareholders. The credit is capped at $200 for single taxpayers or heads of households, and at $400 for married couples filing joint returns. To claim the credit, you need a receipt from the Arizona Department of Veterans’ Services, and to give you a receipt, the ADVS needs your full name, address, and last four digits of your Social Security number. (The SSN numbers are required by law, A.R.S. §41-608.04(F). Sorry.) Send your contribution to MFRF, c/o Arizona Department of Veterans’ Services, 3839 N. 3rd Street, Suite 200, Phoenix, AZ 85012. A form for the contribution is available here. For more information, contact Diane D’Angelo, the MFRF Outreach Coordinator, by email at ddangelo@azdvs.gov or by phone at (602) 263-1837. The same deal applies as with the other credits; you take the credit on your Arizona return, and make sure you include it in your charitable donations for deduction on Schedule A of your federal return, and the contribution is completely offset by the credit and deduction and costs you nothing. Now for the column. This column reprises one of my pet themes over the years, and I thought it was time (in my next-to-penultimate column) to trot it out again. My suggested headline was “It's Not The Mandate, It's The Change,” but the editor found that a bit too obscure. My thanks to Eric Schnurer, whose article, published in Italian (I got the English translation; like James Thurber apparently Eric is not as funny in the original) by the Aspen Institute got me thinking about this topic again. At some point Eric will put the English version up on his website for Public Works, his consulting firm, but it isn’t available yet. Soon both parties -- the Democrats in Washington, the Republicans here in Arizona -- must stop talking and actually produce “change.” Unfortunately, as with TV shows, vegetables, and furniture, it’s easy to convince people to demand something different, but much harder to guess what they want instead. That shouldn’t surprise anybody. Hey, almost half the electorate is men. We frequently don’t want to drive the way we’re going, but as to where we actually should be headed? We don’t know, but we’re not asking for directions. Of course, change is hard. In our system of government, it’s much easier playing defense, because there are many ways to stop things, but to accomplish anything, you must overcome every obstacle. And that’s difficult without a fairly dominant political philosophy or policy consensus. If a strong majority of Americans become convinced that we should have a New Deal, or new civil rights laws, then even substantial procedural hurdles (Senate filibusters, congressional seniority, court decisions) eventually will be overcome. But without a broad consensus -- if people remain conflicted between wanting a better health care system while worrying about losing what they have now -- then process and delay will prevail. It’s rare for a closely-divided legislature to produce worthwhile legislation. Divided government more often leads to gridlock, which (in the absence of major crisis) may be an acceptable second choice to a majority of voters. Gridlock has little to do with tone or civility, which are more of a byproduct of a lack of consensus than its cause. There may be legislatures where really nice key leaders manage to keep their own troops in line and still find time to build and maintain wonderful relationships across the aisle, but that must be rare -- as it requires an entrenched majority that doesn’t overreach. Good luck finding that. And when legislators actually are buddies, then angry voters accuse them of being part of a self-interested club. Voters hate partisanship and bickering, while mistrusting legislators who aren’t partisan and don’t bicker. Divided government or narrow majorities usually result in a narrow, tactical politics, where one branch sees its job as blocking the (obviously unworthy) initiatives of another branch, or the minority senses that the majority is shaky enough that the minority could block the majority from passing some of its program. With politics generally a zero-sum game, making the other side lose is often the only possible form of victory. Whenever the parties are closely matched or government divided, people talk a lot about “governing from the center” and “taking the best ideas of both sides.” But there are two problems with that approach. First, isn’t insisting on splitting the difference between two conflicting approaches just a different form of orthodoxy, assuming that sincere and committed ideologues are always wrong? And how do you combine opposite approaches? Do you cut taxes and raise them at the same time? Decide to spend more on autism research, then cut all spending across the board, including on autism? And second, most elections are determined not by those who follow politics deeply -- the dreaded base voters, you already know whether and how we’ll vote -- but by those lower-information, lower-efficacy undecided voters. Swing voters don’t follow whether an idea came from the D or R camp, or instead is some “govern from the center” synthesis. They’ll know whether something got passed, but only rarely know where it came from. Maybe “pragmatic” compromise is the way to tackle a particular problem. But laws adopted with no bipartisan support are just as valid as those passing unanimously. Governing from the center is a tactic, not a strategy, which may not fit every circumstance. Both parties need to be practical and tactical, but in the sense of getting things done. Big things, requiring an ideological point of view. The economy’s a wreck, the state budget a black hole. Let’s not demand that everybody work together. It’s not about personalities, or tone, or compromise. You can’t average out two different directions, you have to pick one. We’ve got big problems. Let’s not fear fighting over big ideas. Here’s this past Sunday’s column, now we’re caught up. Hope you like the Robert Rubin-Robert Downey line; I thought that would get a rise out of the editor, but nothing. Of course, he’s also so short he can’t stand up, sir, and maybe it’ll get a bigger reaction for you guys. Newspaper version here. Business types (by exquisitely powerful social custom) detest lawyers, because we get paid for providing services but they claim to get paid only for results. But given the world-wide financial meltdown, wouldn’t your 401k be better off if you had gotten rid of all the bankers instead? Even the most successful trial lawyer is far less destructive of wealth than the financiers whose work boiled down to following the herd making highly-leveraged bets on poorly-understood and opaque debt instruments. Admittedly, a year when Robert Rubin’s reputation sinks below that of Robert Downey, Jr. is, by definition, unusual. I also used to worry that I didn’t fully understand these new securities, but unfortunately the financiers being paid millions to create, market, and value this stuff didn’t fully understand them, either. What counts as innovative leadership in business -- staying just ahead of a trend -- is wonderful when the economy grows. But when the business cycle starts topping out, it’s not that great to leap ahead of your competitors if you’ve just moved closer to the front ahead of the crash. But as bad as boom-then-bust seems now, it’s more popular than slow-and-steady. It seems lots of businesses (apart from boring, lawyerly fee-for-service stuff) is basically real estate development with different commodities. Entrepreneurs make money in a hot new area. Others join in. A crowd gathers and generates circular enthusiasm. Prices rise, demand rises faster. People make money, and confuse a rising market for their brilliance and business acumen. Then the market crashes, which absolutely nobody could have foreseen. In just the past decade, we’ve lived through the dot-com and the real estate and finance bubbles, but having seen the one didn’t help us avoid the other. It’s hard to see a bubble from the inside, which requires a degree of objectivity far beyond most of us. It also requires convincing really rich and successful people that they’ve merely been lucky, not smart, which isn’t a very promising business model. And even if you do recognize that you’re in a bubble, what incentive do you have to get out early? Think back to 2002, and whether it made sense to invest in Arizona real estate. In five years, the market will crash, but if you stay out, you’ll miss five wonderful years. It’s also not clear what alternative investments you’d make instead. And if you can use other people’s money, then why not place more bets? Maybe the crash comes a year later than originally predicted. Or maybe if you’re told enough times that you have some special talent for business, you start believing it -- and believing you’re underpaid, too. So after years of worshipping (and paying) CEOs who got lots of credit on the way up, we now learn that they really didn’t understand the risks their companies took to generate those wonderful numbers. It’s “pay-for-performance,” but only the pay was real; the performance, not so much. And to where do richly-compensated, smarter-faster-more efficient market-based giants of business turn, when they didn’t do their jobs properly? To the only group they like less than lawyers: Politicians. Our biggest banks, insurers, and automakers now rely much less on their CEOs than on Congress. So isn’t the pay scale still out of whack? Not that members of Congress should make what a CEO makes, but that bailed-out executives shouldn’t make more than a member of Congress. The leadership needed to run huge companies into the ground shouldn’t be so expensive. Not with such a plentiful supply -- and when what we once thought was smarts was really luck. With my Tribune column ending (along with the Tribune as we know it) on Dec. 31st, this is my last annual Arizona Tax Credit column, which (this being Arizona, where it only takes two times to make something a tradition) is a Thanksgiving weekend regular for me (and thus for you). In fact, my suggested headline was “My Last Annual Arizona Tax Credit Column,” but the editor gave it the same headline as in 2007. Same tax credit amounts, too. You can get the newspaper version here if you want a smaller version to print out for your year-end tax planning and donations. Tax laws do affect behavior. You spend months worrying about declines in your investments, but in December, suddenly you're happy to "harvest" tax losses. In Arizona, the tax laws encourage you to listen to year-end appeals for charitable donations. Of course, you should be giving to charity anyway. But in Arizona, we make it really easy even for die-hard libertarians (a/k/a "the obnoxiously cheap") to become charitable -- because it's free. Several tax credits let you reduce your state income taxes by the amount of your donation. I'm assuming you itemize deductions and don't pay Alternative Minimum Tax. If so, donate by December 31, then in April, pay the same amount less in state tax as you gave away. All it costs you is the stamp and the time to write the checks. And for most of these charities, you can contribute online and save the stamp. First, contributions to "private school tuition organizations" that offer scholarships to private schools qualify for a tax credit for individuals of up to $500 and for married couples up to $1,000. For your PSTO contribution, please consider Schools With Heart, 1131 E. Highland, Phoenix, AZ 85014, or call (602) 252-5866, and designate your contribution for The Family School. You contribute now, then report your contribution on Form 323 when filing state income taxes in April, getting a full dollar-for-dollar credit up to the cap. But make sure to include these donations as charitable contributions on your federal return to get the full benefit. Second, the less-generous public school tax credit lets single taxpayers give and get back up to $200, and married taxpayers, up to $400. You write the check directly to the school, not to a PTO or foundation, and report this credit on Arizona Form 322. Of course, wealthier school districts benefit more from these tax credit donations, so if you want your money to make more of a difference, you should contribute to the Isaac School District, 3348 W. McDowell Road, Phoenix, AZ 85009, or at www.isaacschools.org/district/credit.htm. Your gift is far more significant in a school district with 90 percent of its students at or below poverty and two-thirds from non-English-speaking homes. Third, donations to charities which assist low-income residents qualify for another tax credit if you exceed the "baseline" of your charitable contributions for 1996 or the first year you itemized, if later. Lots of Arizona charities qualify for this Form 321 credit, which is available up to $200 for single taxpayers and $400 for couples. I serve on the board, and having mentioned that can urge you without any guilt whatsoever to contribute to Devereux Arizona's behavioral health programs. Devereux serves children in foster and residential programs who won't get holiday gifts without contributions like yours. You can give gifts at no cost because you'll pay exactly that much less in state income taxes. Send your check to Devereux Arizona, 11000 N. Scottsdale Road, Suite 260, Scottsdale, AZ 85254, or go to www.devereuxaz.org and click on the "My Little Stocking" link. A fourth credit may not be around much longer; a federal judge (who would be called an "activist" except that she's ruling the way the 'wingers want, which makes her a patriot) seems likely to eviscerate Arizona's publicly-financed state elections. But while it lasts, this tax credit is surprisingly generous, $610 for individuals and $1,220 for couples, or up to 20% of your total state tax liability, whichever is greater. Send your contribution to Citizens Clean Election Fund, 1616 W. Adams, Suite 110, Phoenix, AZ 85007, or visit www.azgu.gov/CleanElections/. For this credit, there's no separate form, you credit the donation on Form 140 itself. Finally, after making your cash donations, give something else that you won't miss. Call United Blood Services at (602) 431-9500, or make an appointment online at www.bloodhero.com, to donate blood. Easy, fast, and the post-donation cookies are tasty and guilt-free, too. So make some donations by Dec. 31 and reduce your state taxes on April 15. Yes, it's bad law, but please use it to do good. If Napolitano Heads DHS, Could She Put Arizona State Government On A Terrorist Watch List? This column ran Nov. 23, and luckily for me they didn’t announce the Gov’s appointment as head of Homeland Security until after the column ran. My suggested headline was above but I certainly did not expect any reasonable editor to use that headline. So, if President-elect Barack Obama offers heading the Department of Homeland Security to Gov. Janet Napolitano, and if she accepts -- neither of which are certain as of my deadline, and both of which had better remain uncertain until after publication -- what happens? It fits with the 2008 election results, which meant major change in America, but in Arizona, not so much. Nationally and federally, Democrats did very well, but statewide and locally, Republicans won. Sure, Democrats took two of three Corporation Commission seats -- apparently, the names “Paul Newman” and “Kennedy” are politically potent here as “Stump” -- but other than two-thirds of the “Solar Team,” if it was a Democrat and wasn’t a federal office, 2008 was the new 2004. If the rumors are correct, Arizona gives up a very popular, savvy, and effective Democratic governor who might have checked the worst excesses of an even-more conservative GOP legislature. It helps the country to have her expertise take on the morass at Homeland Security, but won’t do much for the state. If Napolitano does get the Homeland Security job, then maybe Americans -- alone among the nations -- will be able to fly without first removing our shoes. Could we perhaps soon take regularly-priced coffee through airport security, or is that too much to ask? It’s good for the country for Obama to get smart, competent people to serve in his administration, and to have a president whom people are eager to serve, even in difficult positions. Homeland Security is a huge agency, with interagency rivalries making the Pentagon look harmonious, and it’s the offensive line of government: Even if you do your job perfectly, at the end of the day you’re completely beat up anyway, and the announcers mention your name only if things go wrong. There’s only one job in government that’s going to be worse than heading Homeland Security, and that’s being a state governor during the next two years. It was simpler, and far more fun, during a boom, when any governor could both cut taxes and increase spending. To stick with the football analogies, being governor during this recession will be like coaching a bad team that just lost its best players to injury. If you do the best coaching job possible, you’ll narrow the margin of defeat, but it’s never fun (or good for job security) to lose. The only grimly ironic news in Secretary of State Jan Brewer becoming governor is that just as everything goes all to heck, in Arizona we’ll know which party is responsible. The collapse of the real estate economy and national recession mean that our state revenues, dependent on development and consumption, are decreasing at rates economists haven’t seen before and didn’t project. In a political climate that rewards people for complaining that both taxes and university tuitions are far too high, it won’t be pretty. And nobody will have any confusion over who’s in charge. I do have one suggestion for fiscal policy, a “perfect storm” tax. Effective immediately, using that phrase should cost $500. With the increasingly grim economic news, it could raise significant revenue. Arizona could be a test of the GOP debate whether the party should become more centrist or more ideological. Unfortunately for Arizona, we don’t have centrist Republicans anymore, so we’d be the ideological test case. It’s a lot easier to talk about being fiscally “responsible” than it is to cut health care, schools, and public safety. It also creates the temptation to dive into the social conservative swamps, because passing anti-gay, anti-abortion, and bash-the-minorities legislation doesn’t have any fiscal impact. It’ll be perfect for the new regime, both nasty and cheap. You know those pundits who fret with one-party control in Washington, the Democrats might “overreach?” They’re looking in the wrong direction. If you want to see overreaching, just wait if we get a governor who thinks just like the legislature does. Yes, we certainly could have too much of a bad thing. This time, a real headline kvetch. My suggestion was above, but the editor's choice ("Dems focus on results while GOP ponders ideology") makes me sound more certain than I am (after all, I am a Democrat) that the new administration and Congress actually will do the right things. And, you could have fixed it without changing a word just by adding, as I've done below, a colon after "Dems" and capitalizing "Focus." That way it's more of an exhortation than a prediction. And then, lo and behold, after I filed the column, Stan Greenberg and Robert Borosage bring the data in support of the thesis that moderates actually want government to get stuff done. (H/t: Matthew Yglesias) Data and op-ed argument, together at last! I love their line that Obama and the Congress have to produce: "Failure does have consequences, as George Bush proved." I feel the GOP's post-election pain. I became chair of the Arizona Democratic Party after the 1994 Republican sweep, when Newt Gingrich seemed as fresh, exciting, and intellectual as, say, Barack Obama. A Sunday talk show could have only Republican guests, and our only statewide Democratic officeholder was Corporation Commissioner Renz Jennings, who made me seem terse. There's a similar quality to Democrats' plaintive laments fourteen years ago and the GOP's today. Just as we hearkened back to the New Deal or Great Society for current justification, the Republicans are in thrall to the ghost of Ronald Reagan, who is about as relevant today as FDR and LBJ were in 1994. "We gave you Medicare, and you turned on us!" said the D's, just as Republicans today say, "We're the Party of Reagan, and now that means nothing to you?" Well, yes. We Democrats went through the same "they like our ideas but they don't like us, what's with that?" phase that Republicans are going through. There's a difference, though. When Democrats talk about ideas, what we really mean are things like health insurance, jobs, and education. When Republicans talk about idea, what they really mean is ideology -- cut taxes, and cut spending that doesn't affect me. And that's the difference, because most people aren't that ideological. Oh, there are some consistent ideological philosophers who resent reality for not conforming to their theories. Some teenage boys, too old for dinosaur toys while still too nerdy for girls, are wonderful libertarians. There may be some leftists who still believe in government programs for their own sake, in the dystopian vision of "equality" in the Kurt Vonnegut's "Harrison Bergeron." But I frequent most places in Arizona where lefties hang out, and if those folks still exist, I'm just not seeing them. But I hear all the time from 'wingers convinced that conservatism hasn't failed, it (after eight years of Bush-Cheney!) just hasn't been tried yet. As Ed Kilgore noted last week, liberals tempered their ideology to support Barack Obama, and cut him slack during the election -- while 'wingers made John McCain demonstrate his fidelity to conservative dogma all the way to Election Day. And Democrats know that we'll be judged in 2010 and '12 on whether the economy turns around and the Iraq war ends, not on whether we complied with an abstract governing philosophy. It's easy to convince people that they should pay less in taxes, but it's not nearly as easy to make them demand less from government. George W. Bush is getting a raw deal from Republicans these days, because the supposedly bad "big government" stuff -- Medicare Part D, No Child Left Behind, the farm bill, the steel tariff, the big increases in domestic spending -- all happened during the first term, and Bush was triumphantly reelected in 2004. During the second term, Bush laid on the conservatism, with far more restrictive budgets and attempting to privatize Social Security, and voters turned on him in record numbers. After governing more conservatively, he's about as popular as Nixon when he resigned, but then again, we're a less forgiving people than we were 30 years ago. Even if they don't like government in general, people do expect things from Washington. They mock government agencies, but expect that FEMA won't collapse during a Katrina and leave Americans suffering in Fourth World conditions. 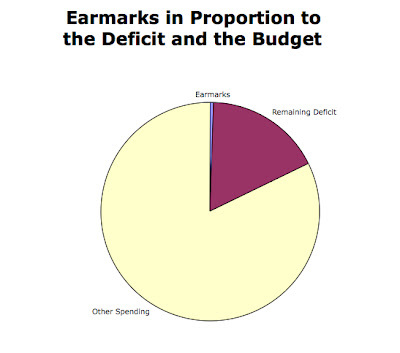 They detest earmarks in general, but support funding for breast cancer studies, children's hospitals, and highways -- and don't dare touch foreign aid for Israel, another earmark. People support across-the-board spending freezes, but also want new spending for veterans' health, space exploration, and medical research. All those things involve taxing everybody to pay for things that don't necessarily benefit everybody. Republicans now call that socialism. And Republicans are welcome to make a priority of cutting capital gains taxes, if they think the most important thing is helping people who still have any net capital gains to tax. The GOP is welcome to talk about core principles among themselves, but the new Democratic administration and the Congress? Their job is to get stuff done. Fast. It's not like any of the pundits worried about facts before the election. The Tribune dropped the Perspective section this week; the columns now appear at the back of the tabloid-format news section on Sunday. I just don't think my stuff looks as good in a tabloid format, I'm more of a broadsheet kind of guy, but it's a "transforming" industry. Hey, at least newspapers are more profitable than the banks. Results still aren't final in AZ, and won't be for another week. Turnout should creep up, but there's no way it'll get to pre-election estimates and I strongly doubt it'll reach 2004 levels. The third Corporation Commission seat is still undetermined; the Democrat in third place had it Friday afternoon, but additional votes over the weekend switched to the Republican formerly in fourth place. The margins are now about 3,000 votes out of 5.2 million (800,000 per position) cast, above the mandatory recount threshold. It's still too early for election punditry, because Arizona now has a six-week election "day." Early ballots are mailed a month before, and counting the votes takes an additional week. So fine distinctions (turnout was down from 2004 -- but by how much?) wait until next week. Maricopa County election officials estimated that 113,000 early ballots were dropped off at polling places on election day (which must be checked before being counted) and another 80,000 to 100,000 voters cast provisional ballots (which have to be checked more thoroughly, and up to 40 percent may not be counted). We have to wait to start the real number-crunching, but here are some preliminary thoughts. First, we know that (except for Arizona and Alaska) polling works. And with statistical sampling validated by the voters, the next time my doctor orders a blood test, I can get by with that little smear, I don't have to make her take it all. The biggest innovation for political junkies this cycle was the polling aggregation websites that crunched numerous polls into models and graphical trendlines. You even have your choice: left (fivethirtyeight.com), right (realclearpolitics.com), and wonky (pollster.com). As a 5 percent margin of error means that even a perfectly-designed and executed poll will be wrong once every 20 times, I've become a believer in putting multiple polls together to get a better overall result. We now know that the 2008 presidential election was easy to predict. Only seven (seven!) states were closer than 5 percentage points; only 15 were closer than 10 percent. Those are notable decreases from 2004 (10 and 21) and 2000 (12 and 22). If margins are that large, it's easier to predict the winner. Still, pollsters are having a difficult time figuring out whether and how to call cellphones; turnout models need to be tweaked for every election. So despite all these graphs and aggregations, nothing stopped me from being very, very nervous until the networks called Ohio for Obama. Second, I guessed completely wrong on Arizona turnout. Our GOP Secretary of State also thought we'd set a record, based on registration and early ballot requests; instead, turnout was around 65 percent, a bit above the 2006 off-year gubernatorial election (61 percent) but well below the 2004 presidential election (77 percent). The other state with turnout well under 2004 levels? Alaska, where turnout appears to be well beneath 2004's 66 percent and possibly lower than 2000's 60 percent. So if you think too many people vote, or that ballot-counters need less work, there's a simple solution: Put somebody from your state on the national GOP ticket. Nationally, turnout soared; (preliminary) national turnout of 64 percent is the highest in more than 40 years, and a considerable leap from 2004's 55 percent and 2000's 51 percent. In Arizona, Democrats assumed that Arizona turnout would rise, and concentrated on urging low-efficacy voters to complete the entire ballot. Instead, with Arizona never really "in play" until the last minute, voter enthusiasm here (and Alaska) never matched what we saw in the rest of the country. New Arizona state slogan: "We found the 2008 election less interesting than Bush vs. Kerry." Low turnout yielded the most anomalous result, at least for somebody who cut their political teeth here during the 1980's. I grew up seeing national and statewide Democrats get creamed, while local candidates could survive and thrive. Instead, last week national and statewide Democratic candidates did fabulously well -- for Congress, Harry Mitchell wins by 10 points, Ann Kirkpatrick and Gabrielle Giffords by even more, and Democrats sweep the three Corporation Commission races (subject to a potential recount on the third seat) and take control in one fell swoop -- while D's also lost a state Senate seat and two to four state House seats. Maybe it's just the "native son" effect, which here depresses turnout. Or maybe we have more in common with Utah, Wyoming, and Idaho (where McCain got over 60 percent) than we do with Nevada, New Mexico, and Colorado. You bet I'll want to look at the numbers -- when we finally get them. From Tuesday's Horizon broadcast: Analysis of Rep. Harry Mitchell's easy re-election begins at 20:00 but you want to go to 21:30 for the real scoop. If the embed doesn't work, try this link. I had thought that we weren’t supposed to do election stuff beginning this weekend, but my opposite number did a piece entitled “Democratic victory can only bring danger” (no exclamation points, but you could feel they were supposed to be there), which you can see here. I then wrote a counterpart (newspaper version here) so both could be packaged together. My suggested headline was above but that wasn’t upset enough to match up properly with the other side. Sometimes it’s just so tiring to be the angry left. Again, I’m the D talking head on Horizon (PBS Channel 8 Tempe) Tuesday night, 10 – 11 pm, doing local and AZ election punditry, then again on the McMahon Group, which will air Sunday 11/9 at 4 pm on KTAR radio. I’m getting slightly woozy over which McCain argument I’m supposed to rebut this weekend. First, the Republicans argue that we should elect the Arizona Republican because he’ll be real change -- from the incumbent Republican. We need change! Then they argue that we can’t elect Obama because then the Democratic Congress will have a free reign to do things. We must stop the Democrats from giving us change! Change! No, stop change from happening! Remember when politicians were supposed to stay “on message” with just one message? The good old days, when you needed two candidates, not just one, to have a debate? You wonder where these “we need gridlock!” Republicans were the past 3 presidential elections. With the GOP firmly in control of Congress, shouldn’t they have supported Bill Clinton, Al Gore, and John Kerry, to provide a much-needed check on the partisan excesses of Trent Lott and Tom Delay? Oh, wait. There’s also a weird quality to GOP demands that Democrats must work “across the partisan divide,” that only bipartisan solutions can solve our problems. McCain is supposedly a better choice because of his past record of working with Democrats -- so we should elect him Tuesday so he can become president and refuse to work with Democrats. These are rather politically-oriented arguments from those who claim to be rising “above politics.” I’m not much of a believer in the deeply-held American myth that politics and government are best populated by amateurs. “I’m not a politician,” cry people running for elective office, the very definition of a politician. Or that you’re not a “career politician,” because unlike every other form of human endeavor, in politics having experience apparently makes you less competent. I’m also not big on anti-partisanship, the belief that there are somewhere-in-the-middle solutions around which we all can coalesce if only both sides’ extremists would let us. So what exactly are these incredibly obvious compromises, that the Iraq war would have been wise and popular if we had invaded with 65,000 troops instead of 130,000? That gay marriage would be resolved if gays could marry but then had to get divorced after 5 years? Then when both parties do reject their extremists and come together at a time of a national crisis, the same anti-partisans reject these “expert” solutions of those back-scratching “Washington insiders.” McCain found out how well an immigration compromise played with GOP primary voters, and didn’t everybody just absolutely love the bank bailout? But even if you believe that politics is beneath you and that ideologically-consistent political parties -- rather than making voting generally clearer, and allowing like-minded people to organize for greater impact -- are bad, the closing days of this campaign, at least on the GOP side, aren’t going well for this faux bipartisanship. I’ve learned that because (like John McCain, or at least the 2000 version) I support a graduated income tax, and support taking money from one group (taxpayers) and giving to another (teachers and schools), I’m a socialist. So which one of us is the extremist? It’s no big deal to call me a redistributionist; it makes me nostalgic for my brief political career. And I don’t take it that seriously when McCain or Palin talk about the “real America” that clearly excludes me. But as Matthew Yglesias wrote last week, there are lots of Americans who might take this “real America” business differently. You might think differently about whether the Constitution was “perfect” if your ancestors were legally not “real” and got counted as 3/5ths of a person. Lots of pundits talk about crucial voting demographics as if the only votes that “really” count are white, blue-collar males. There are Arizonans who happen to be Hispanic whose families have lived here for dozens of generations getting lectured on what it means to be a “real” American by recent transplants from the Midwest. I don’t think America has much to fear from Tuesday’s election. At least not the America that includes us all, not just GOP-approved “real” Americans. That was my suggested headline, but I really didn't like it; but I certainly didn't expect the editor to go all Latin on me instead. They first seized upon the Community Reinvestment Act. The CRA prohibits redlining, where banks refuse to lend where they take deposits. Of course, nothing in the CRA requires banks to make bad loans; the CRA prohibits banks from taking money out of a community where the bank isn’t willing to invest. There are a couple of problems with blaming the CRA. First, ‘wingers have no explanation of how a 1977 law passed created the real estate and subprime bubble 25 years later. If banks managed to make CRA loans successfully for two decades, but then suddenly became wildly irresponsible, the problem isn’t the CRA. More technically, as Robert Gordon of the Center for American Progress, and Ellen Seidman, former head of the Office of Thrift Regulation, have noted, the CRA only applies to federally-insured banks and thrifts, which accounted for about 25 percent of subprime loans; half of that market was controlled by independent mortgage companies not covered by CRA, and another 25 to 30 percent from bank subsidiaries and affiliates, which don’t have nearly as significant responsibilities under the CRA. Also, institutions covered by CRA made fewer such loans than did comparable exempt or partially-exempt lenders. Finally, the CRA usually becomes an issue only when banks or thrifts seek to merge -- and the previous wave of bank mergers generally ended by 2001, just as the real estate boom, and subprime lending, took off. Blaming the CRA requires that you believe the Bush administration was serious about enforcing one, and only one, type of bank regulation. Hey, ‘wingers, if it’s all the CRA’s fault, let’s trade the CRA for getting back the 1993 tax code. Deal? The next attempt to pass the blame goes to Fannie Mae and Freddie Mac, which does have some plausibility because the two did participate, big time, in subprime lending. But Fannie and Freddie got to the party late, and while they contributed to the crisis, none of the ‘wingers can explain how bad real estate loans securitized or guaranteed by Fannie and Freddie, which have since been guaranteed by the U.S. government, brought down Lehmann Brothers, Bear Stearns, and AIG, or how low-income borrowers with bad loans have cratered the global financial system by falling behind on their mortgages. At a congressional hearing last week, former Fed chairman Alan Greenspan, SEC chairman Christopher Cox, and former Treasury secretary John Snow each were asked if Fannie and Freddie were the cause of the financial crisis. All three said no. “I made a mistake in presuming that the self-interests of organizations, specifically banks and others, were such as that they were best capable of protecting their own shareholders and their equity in the firms,” Mr. Greenspan said. Mr. Waxman pressed the former Fed chair to clarify his words. “In other words, you found that your view of the world, your ideology, was not right, it was not working,” Mr. Waxman said. “Absolutely, precisely,” Mr. Greenspan replied. If Alan Greenspan -- the High Priest of the Temple of Ayn Rand, the very face of Libertarian market triumphalism -- is rethinking his philosophy, then maybe the problem really wasn’t “too much government.” Not when it’s a GOP administration nationalizing the banks. Welcome to reality, ‘wingers! Some people might think a prosecutor shouldn't jump to conclusions and make erroneous charges based on newspaper articles that were later corrected by the newspaper. Apparently that doesn't include Andrew Thomas and his supporters. I had toyed with the idea, in response to state Rep. Russell Pearce's attempt Friday to distract people from Thomas's mistakes and inaccurate charges, that I would in turn call for the Attorney General to investigate Pearce's call for the Attorney General to investigate how the Attorney General awarded a contract to my law firm for health care law specialty work used by the state for the Arizona Veterans Home. But I couldn't figure out where to put the jokes, or exactly how the AG could investigate the AG's investigation of the AG's office. Didn't bother Pearce, but I worry about those sorts of things. I like the Tribune's headline better: "Tribune: Thomas accusations against Nelson wrong." (Key quote: "The Tribune found multiple inaccuracies within statements made by Thomas and his campaign.") Maybe Russell Pearce should investigate that. The current proportion of U.S. Jews backing Obama is identical to the level of support the Democratic ticket of John Kerry and John Edwards received in the 2004 presidential election (74%). It is only slightly lower than what Al Gore and Joe Lieberman received in 2000 (80%) -- when the first Jewish American appeared on the presidential ticket of a major party. Recent support for Obama is a bit higher among older Jews than among Jews younger than 55. According to combined Gallup Poll Daily tracking data from Sept. 1 through Oct. 21, an average of 74% of Jews aged 55 and older supported Obama for president across this period, compared with about two-thirds of younger Jews. UPDATE: Franklin Foer makes the inevitable Sarah Silverman reference! Home warranties (201): A fairly interesting legal and political question. Developers have come up with CC&Rs for new communities that severely restrict warranty claims, both by individual homeowners and by associations, putting them into arbitration and limiting the time for raising claims. It’s a voluntary contract, you don’t have to buy into one of these CC&R communities, and I’ve drafted some of these provisions for clients myself. So this initiative resets the ground rules, mooting these CC&R provisions, because who actually reads (or understands) the CC&Rs before buying a home, and these days in Arizona you can’t buy a new home without having CC&Rs. It’s interesting, because a lot of the same people who want the state legislature to impose rules on HOAs would tend to oppose this initiative (and the “no” campaign is “stop lawsuit abuse.”) This one scrambles the usual right-left political divide, but I came down in favor of “consumer representatives” instead of “developers” (not that there are really any developers left in the current real estate market). Employer sanctions fixes (202): So do you vote on what’s better (certainly not best) for public policy, which is these corrections to the 2006 anti-illegal immigrant initiative approved by the voters, or do you vote to “heighten the contradictions” by letting the heavily R business community stew in their own juices, they made their bed, why should we clean up for them after their pals Russell Pearce and Joe Arpaio, etc., all of which is a valid argument to vote no? This referendum basically keeps all of the bad stuff against individuals, but provides relief to the employers. You decide if that’s a good thing or not. I forget how I voted on this one, seriously. Legislator pay (300): Like it has any chance of passing. On the judges, no obvious clunkers, all deserve retention. There’s some grumbling on the left about some of these judges, but I’m especially supportive of Scott Bales on the Supreme Court and Ann Timmer on the Court of Appeals. Some lawyers don’t like Linda Akers but I voted for her. Akers used to be US Attorney for Arizona, and at the time (during the halcyon years of the George H. W. Bush administration) was seen as very partisan, but that’s another thing that George W. Bush has done for (to?) our country; the standards for politicization of US Attorneys has descended so much that Judge Akers is now a statesman. These days, even Democrats pine for the decency and standards of the Age of Gingrich. With the recession already here, remember: Countries are not like people. Their budgets should work differently. I thought we’d settled this argument in 1971 when Richard Nixon said “We are all Keynesians now.” But with the Republican Party becoming more extreme each year, what Nixon believed is apparently liberal heresy today. John Maynard Keynes first noted that consumers and businesses, making rational individual decisions, could lead to less-than-optimum results for the overall economy. Keynes concluded that an economy could reach equilibrium at less than full employment, with insufficient aggregate demand resulting in higher unemployment and lower output than necessary. Keynes saw two ways that government could help boost aggregate demand during slumps, monetary and fiscal policy. In the former, lower interest rates would make borrowing cheaper and encourage businesses to borrow and invest. For the latter, governments could invest in infrastructure, with a “multiplier” effect as spending creates construction jobs, giving more people income to buy things, which creates retail jobs, and so forth. If the economy is heading for a recession, you’d lower interest rates and increase government spending. The opposite is true during a boom; to keep things from getting out of control, the government should raise interest rates, spend less, or raise taxes during good times to prevent asset bubbles and inflation. We forgot to be countercyclical on the way up -- but that’s no reason to forget on the way down. Some ‘wingers still pretend to believe in supply-side economics, that lower tax rates somehow raises revenues. Even the Bush administration doesn’t believe that fairy tale anymore. And for the past 15 years, the economy acted exactly the opposite as supply-siders claimed. We raised taxes in 1993, and the economy boomed; George W. Bush’s 10-year tax cuts are still phasing in, and the economy is in recession. And even supply-siders believe in the economic multiplier effect of a Super Bowl; why wouldn’t something permanent, like a new university building or transit system, have the same, if not greater, multiplier effect? During a recession, what should individuals do? Spend less, save more. It makes sense for individuals, but what if you’re a retail business, and your customers cut back? Last week, the Census Bureau announced preliminary September retail sales figures, which dropped 1.2 percent from August, and 4.3 percent in real terms from the previous year. In an economy dependent on consumer spending, consumers are spending less. It makes sense for individuals, but it’s bad in the aggregate. What should businesses do? Sequoia Capital, a venture capital firm in Silicon Valley, summoned the CEOs of the businesses in which Sequoia invested; the only previous mandatory meeting was for during the dot.com bust. The companies were instructed to fire employees, reduce spending, curb investment, and cut salaries. Which is perfectly rational for each company, but means not only are consumers spending less, so are businesses -- and that’s even if they could get loans in the credit crunch. We can’t expect lower interest rates to do much; official rates are historically low, and recent Federal Reserve moves haven’t resulted in spurring lending, because the banks are as scared of each other and the overall economy as are consumers and businesses. Again, it’s rational individual decisions leading to bad overall results. The only cavalry that could ride over this gloomy event horizon is the government. Unless you want a really long recession, you should stop fretting about budget deficits. States and cities are cutting back; they have to have balanced budgets. Consumers and businesses are cutting back; they’re scared. You could cut their taxes, and they’d be too scared to spend. We once had a president who, faced with a recession and loss of faith in the economy, had the government do the individually responsible thing. He cut spending, increased revenues to eliminate a deficit, and looked for voluntary efforts to bring the economy around. His name was Herbert Hoover. So whenever you hear the government-should-act-like-a-family-budget analogy, remember: That’s Herbert Hoover talking! Your grandparents tried it, and they didn’t like it. 4:59:46, which is under 5 hours, but just barely. Photos are here. Results are here. After last year, the marathon went to a color-coded system based on heat and humidity; we started at the yellow level, but by mile 15, the "threat level" was elevated to red (but with Gatorade instead of duct tape and plastic sheeting.) But it's probably that I'm just getting slower, too, and only have so many more marathons in me before I should leave it to the younger guys. 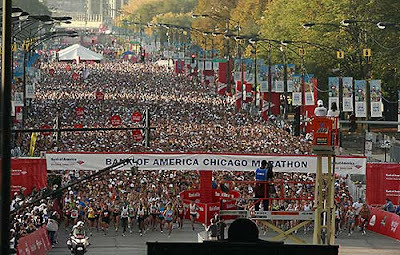 Anybody have a sponsor entry to Boston to spare? Here's this week's column, which I originally wrote for the "He said, she said" Obama-McCain pieces the previous week, but the editor wanted more than one issue so this got bumped. Few law firms these days are partnerships, but at mine we still refer to our colleagues as partners, and that's how we try to behave. We fuss endlessly over minor matters so everybody gets their say, and (on good days, anyway) worry about feelings almost, but not quite, as much as money. Like most relationships, some days I drive my partners nuts and vice versa, but mostly we all pull in the same direction. One way we look out for each other is with health insurance. One of my partners has a long-standing medical condition, completely unrelated to diet, activities, or lifestyle, which developed unexpectedly after law school so we can't blame heredity. The problem makes our annual search for group coverage more difficult and expensive. Most of us could get cheaper insurance for ourselves and our families without this medical problem in our group, but we're not going to abandon our friend and partner. Not only would it cut against the collegiality we strive to achieve, but forcing our partner to find separate coverage would be hugely expensive. A small savings for most would mean huge increases in costs for one - if an insurer would write a policy despite a serious preexisting condition. The sailors may have calmed the seas by tossing Jonah overboard, but there's no guarantee an insurer would spit out our partner on dry land. (The more likely exit would be from the whale's other end.) Having a group means we cross-subsidize each other, because while one has a problem today, others could be the problem tomorrow, and we're all better off spreading that risk. There's no magic to having health insurance tied to employment, and there are lots of reasons why you'd want to de-couple insurance from work. But there aren't that many other ways to form a group where we can share risk. We tried a voluntary group; we even joined the Arizona Hispanic Chamber of Commerce to get a group policy -- but that program fell apart as healthier individuals and groups opted for cheaper insurance, leaving only the less-healthy to face increasing premiums. We don't want to risk the individual insurance market. It's not just tax policy that's keeping us out; as partners, we're taxed on our premiums. It's also because the individual market is more expensive, has higher administrative costs, and lets insurers pick and choose based on age, gender, geography, and preexisting conditions. Studies indicate that a typical family must pay more than $2,000 per year additional just to get the same coverage available in a group -- and the numbers would be far worse for our partner with the preexisting condition. Why does this matter for this election? The two candidates have very different views of the problem. Barack Obama's plan would build on the current system, requiring all employers except small business to provide insurance directly or else contribute to the cost. Instead of the current individual market, he'd create an insurance exchange where small businesses and those lacking coverage could buy health insurance (either private or public) with tax credits. His plan also expands coverage under Medicaid and the State Children's Health Insurance Program, S-CHIP. In our case, we'd still have our little group, or could participate through an insurance exchange; we wouldn't have to cast our medically-challenged partner adrift. We'd head in a very different direction under John McCain's plan. Apart from the tax hike on benefits, and the $1.5 trillion cut to Medicare, his plan would break apart employer-based coverage and force people into the individual market. The theory is that comparison shopping, along with increased price sensitivity and opening ourselves to potential costs of medical risks, will make us better consumers and ultimately save money. But that kind of individualized, economically-driven market means that we'd toss our friend and partner over the side. So in the end, it's both a policy and a moral choice. Obama's plan will make health care more affordable, accessible, and efficient. A new study says his plan will cover 34 million uninsured, the competing plan only 2 million. But more than that, Obama's plan is designed for an America where we work together and assist each other, where helping a friend doesn't become a dumb economic decision. So vote for change -- and for a better America. John Dingell Is a Dinosaur. John Dingell Was Right. "I just want to remind my colleagues what happened the last time the committee on banking brought a bill on the floor which deregulated the savings and loans. It wound up imposing upon the taxpayers of this nation about a $500 billion liability," Dingell said. "Having said that, what we are creating now is a group of institutions which are too big too fail. Not only are they going to be big banks, but they are going to be big everything." Dingell warned in that 1999 speech that one day the bill will come due. "Taxpayers are going to be called upon to cure the failures we are creating tonight and it is going to cost a lot of money, and it is coming. Just be prepared for those events," he said. This week's column was paired with one by Linda Turley-Hansen, who did the "vote for McCain" side to my vote for Obama column. My newspaper version is here while hers is here. I originally went small and personal, discussing health care as my issue to make the larger point, but because Linda covered the a wide range of issues, I had to as well. The bad news is that I had to write two columns in 24 hours last week. The good news is that next week's column is already written, so I can fast in peace on Thursday. Or at least only worry about my sins, not my deadline. There are elections where candidates and voters focus on personalities, wardrobe choices, or so-called “gaffes.” Then there are elections where voters get a clear choice on important issues. This is one of those “choice” elections. It’s still a campaign, with plenty of silliness, talking in code, and serious issues reduced to four-second sound bites. But despite the noise, we can choose between two very different directions. Take the economy. Barack Obama has ambitious plans for greater economic security for the poor and middle class. He wants to cut taxes for 80 percent of Americans, only raising them on those making more than $250,000. He wants to spend more on education, energy independence, and job creation. He will not renew the Bush tax cuts, which mostly benefitted those at the top. If you think the economy is fundamentally sound, and that we should continue the Bush tax cuts and deregulation of financial markets, then you can choose that course. But if you want a different direction, you should vote for Obama. There’s foreign policy. Obama believes the big mistake of the past eight years was starting the Iraq war; he rejects the philosophy which justified that war, the Bush doctrine of preemption. The opposing view thinks the big mistake of the past four years was opposing the surge, supports preemption, and attacks Obama for willingness to talk with potential adversaries. If you think the Iraq war was a good idea, that it makes sense for the U.S. to attack other countries preemptively even if the threat isn’t imminent, and that any form of diplomacy is an admission of weakness, then you can continue those policies. But if you want change, you should vote for Obama. In health care, Obama wants to expand coverage of the uninsured, building on the existing employer-based system while allowing individuals and small businesses help obtaining insurance with tax credits without preexisting condition exclusions. The alternative wants to eliminate the employer-based system by making the fringe benefit taxable, moving everyone into the individual market and making people more at risk for their health care. If you think that people don’t pay enough for their health care, that you’ll get better coverage as an individual than in a group, and that the uninsured and underinsured really aren’t a problem, then you can stay that course. But if you want to change direction, you should vote for Obama. For energy, Obama wants to spend $150 billion over 10 years developing clean energy, “green collar” jobs, and conservation. Others say if we just drill in more places, that’s enough. If you think we don’t need fundamental change to our energy policies, that we can solve our problems by substituting U.S. oil for imports, then you can vote to continue our current policies. But if you recognize that we must change our use and mix of energy substantially, which requires public investment and leadership, then you should vote for Obama. Obama wants to increase funding for Head Start and early childhood education instead of freezing it, or even subjecting those programs to an across-the-board cut in discretionary spending. Obama has called for changes in the bankruptcy code and greater market oversight, while current policy frets that we haven’t deregulated enough. Obama supports a woman’s right to choose; current policy doesn’t. If you want to keep going in the same direction as the past eight years, you have that choice. If you want change, you should vote for Obama. Then there’s style, which matters to some. Obama can be professorial, even downright boring. He listens to people, thinks before he speaks, and doesn’t make rash moves. But he’s not pretending that by sheer force of personality, he can take discredited policies and obsolete ideology and somehow make them work after eight years of miserable failure. He is proposing real, substantive change in policy -- not just not personality. Are you better off today than you were eight years ago? Maybe you are, and if so, vote for the policies that have helped you. If you’re not, you should vote for change, not more of the same. To me, it’s a very clear choice. Vote for Obama. Happy New Year to those of us of the Jewish persuasion. Now I have to remember to write 5769 on my checks. This column is now generally moot (well, at least until tomorrow). But I figured I had to take a stand on the bailout -- and not the one I thought I would take last Monday. Sheesh, I hate being responsible. It’s no longer the mommy party and the daddy party; instead we have the grown-up party and the other party. But I am glad to see that those of you who don’t live in Arizona are starting to see the John McCain that we’ve had to live with. It might appear that the current financial crisis is getting worse. The largest bank failure ever, Washington Mutual, happened last Thursday, when usually the regulators shut down failed banks on Fridays so they have the weekend to sort things out. So the previous record failure, IndyMac, lost its title after only a few short weeks. It’s like how the home run record kept falling in the late 1990’s, with poorly-understood and improperly-underwritten mortgage-backed securities playing the role of steroids. It might appear that while you’re still getting credit card solicitations, the effects of the credit crunch are spreading. Short-term credit markets (overnight Treasury repos, short-term commercial paper, and floating-rate municipal bonds) are showing increasing stress. These are basic commercial markets, where companies with some extra cash park money to earn some extra interest, while companies needing liquidity can borrow relatively cheaply. But the amounts aren’t huge, so if the companies with extra cash get spooked, they’ll just hoard their cash -- and a good business with seasonal or fluctuating results might run short for payroll. It also might appear that despite the toxic unpopularity of the financial bailout politically, including a huge national case of schadenfreude over letting those Wall Street types get what they’ve got coming, the disease is worse than the cure, and we’re going to have to take our medicine. There are all sorts of reasons why a government bailout is wrong in theory, and the original Paulson plan -- give us $700 billion, right now, and no oversight please, we’re Republicans -- was a 3-page joke. But in practice, we don’t have better alternatives to a bailout. As Steven Pearlstein wrote in The Washington Post, the problem is that we can try to prevent a financial meltdown or try to teach Wall Street a lesson, but we can’t do both at the same time. And it might appear that here in Arizona, where so much of our economy depends on finance, insurance, and real estate, we shouldn’t get too high-and-mighty about those scoundrels who made and securitized bad loans into incomprehensible financial instruments now worth peanuts. Those same bad lending standards and loose credits powered our own boom in real estate prices. Sure, we talk about climate, our low tax burden, the California regulatory state; we should have been saluting loose lenders, incompetent underwriters, and the greater fools bought, bought, bought both real estate and mortgage-backed securities, because they deserve the credit, not us. Yeah, Wall Street stinks, but we also had a ticket on that gravy train, given the centrality in Arizona of real estate transactions, construction, and homebuilding. It’s going to take a long time to work off the hangover from the binge that caused home prices to leap past sustainable levels. Based on long-term historical trends, prices still have a way to fall. But getting over our hangover won’t be any easier if the credit markets noisily seize up. And it might appear that the “conservative” approach to the crisis are merely political fig-leafs to have a “plan,” no matter how incoherent, to justify ideological intransigence. As for government “insurance” of these financial instruments, it’s not clear how insuring securities at face value is better than purchasing them at a discount, but it does hide the cost a bit. And a two-year suspension of capital gains taxes, supposedly to encourage sales of assets, is just nonsense. The credit crunch is due to securities that have lost value, and eliminating the tax makes them harder to sell because those losses can’t be used to offset other gains. So the bailout stinks, but the alternatives are worse. There, I’ve taken a stand, without (tempting though it was) suspending my column-writing duties due to the crisis. That’s more “straight talk” than you’ve gotten from our state’s senior senator, who was “mostly silent” at the White House meeting he orchestrated, retired to one of his homes by 6 pm, and whose campaign issued a statement that “he did not attack any proposal, or endorse any plan.” Darn, I wish I could show leadership like that. Here's the column that ran this past Sunday. My suggested headline was above, but the editor went for the separation angle instead. I liked "religiously incorrect" because of the way "politically incorrect" has become shorthand for saying, "Yes this is offensive, but I want to say it anyway--especially if you'll find it offensive, now you can't complain." The small college is Viterbo University in La Crosse, Wisconsin, where I went on a Congress-to-Campus visit. People couldn't have been nicer and more sympathetic about our loss and my having to cut short my visit . I also like going to small Catholic schools, because they usually have social work degree programs. My GOP former member colleague expects to sail through a Catholic school, but those social work faculty members keep pinning him down on issues like mental health parity and TANF. I'm now conversant on the different Franciscan orders, which might come in handy if I find myself in Assisi. While visiting a small Franciscan college last week, I toured a nearby historic chapel with the college priest, who learned that I was headed to a family funeral. While knowing I wasn’t a Catholic, he offered to say a prayer for the rest of my relative’s soul. I appreciated his gesture and took comfort. I also figured, what the heck, it couldn’t hurt. But not everybody feels warm and fuzzy about receiving a proffered benefit of another’s religious belief, especially when you’re not asked first. Take the Church of Jesus Christ of Latter-day Saints practice of posthumous baptism, where LDS believers represent a deceased non-Mormons in a symbolic baptism (hence it’s also called vicarious or proxy baptism). Baptism is required to enter the Kingdom of Heaven, but under LDS doctrine, the deceased have free agency, the power to accept or reject the proxy baptism. From that perspective, posthumous baptism “couldn’t hurt.” Current LDS Church members can grant their ancestors and relatives entrance to heaven. Yet each person, even after death, may accept or reject the proxy baptism, so the ceremony isn’t binding in any way. But not everybody feels “it couldn’t hurt,” and controversy erupted in the 1990s with the discovery that LDS proxy baptisms included many Jewish victims of the Holocaust, with some 380,000 Jews killed by the Nazis appearing in LDS genealogical records. In 1995, the LDS Church agreed to stop the practice for Holocaust victims where descendants did not consent. Jewish groups strongly objected, partly from the sad Jewish historical experience with forced conversions, and partly from the special regard that Jews have for Holocaust victims and survivors. If the victims were killed solely for their religion, a posthumous conversion -- even one grounded in doctrinal free agency, to be accepted or rejected voluntarily-- could appear to rewrite the historical record. So sometimes when you think it couldn’t hurt, it actually does. I had some readers who believe differently than I do offer to pray for me because of last week’s column. One guy even seemed pretty sincere. But it points out one pretty big difference between religion and politics, and a problem for those who want more religion in politics: The whole point of politics in a democracy is to argue about what’s best, but with religion, you just can’t do that. We can argue about whether the problem with health care is caused because people aren’t faced with the economic consequences of their choices, or if health care isn’t like other consumer goods because people don’t respond that way to their own health and their physicians. We can argue about whether we should bail out AIG and not Lehman Brothers. But it’s hard to argue in any productive way about whether my view of the non-divinity of Jesus is better than yours. After all, listing certain dead people on a secret baptismal list makes some who believe differently absolutely furious. Religion is all about fundamental belief -- and even bringing it up in any discussion is an invitation for everybody to take offense. One man’s pithy comment another man finds politically, and religiously, incorrect. And why would we want more of that in politics? So maybe the separation of church and state makes sense after all. Those who took such umbrage at religious discussion, stated more in terms of my beliefs than theirs, or of the precise religious content of the Catholic Campaign for Human Development, should think long and hard about my overall argument against putting more religion into politics. And thanks to Prof. Mark Kleiman at UCLA, I now have a non-religious way to make the same initial point: Martin Luther King was a community organizer. George Wallace was a governor. Now pick your side of that argument.